The video game publisher joins an elite club, but investors should pay more attention to the business. Activision Blizzard's (NASDAQ:ATVI) stock hit a fresh all-time high last week after news broke that it was joining a select club: Its shares were added to the U.S.' premier S&P 500 stock market index as of the close of trading on Friday, Aug. 28. Activision joins rival video game publisher Electronic Arts as the only other member of the S&P 500's "home entertainment software" sub-category. That sector happens to be a crazy-good place to be doing business in at the moment. Over the last three years, EA's operating cash flow has improved from a $700 million annual pace to $1.2 billion. And its earnings have spiked through the same period -- up from $1.69 per share to an expected $2.85 per share this year. As a result, EA is currently the fifth best-performing stock in the entire S&P 500 index. Two industrywide trends are powering that sharp operating improvement. First, we're in the middle of the strongest generational upgrade of video game consoles yet. The installed base of Xbox One and PlayStation 4 devices is already passed 15 million just in the United States. Retailer GameStop recently announced that to date it has sold three times the number of PS4 devices -- and twice as many Xbox Ones -- versus the prior generation's first 22 months of availability. There's also the fact that digital sales are reshaping the industry in a way that favors game publishers like EA and ATVI. Purchases of downloadable content, subscriptions, and full game downloads are skyrocketing, turning games into year-long revenue streams rather than release-driven events. And that boost has helped EA's gross profit margin leap from 63% of sales five years ago to an expected 72% in 2015. 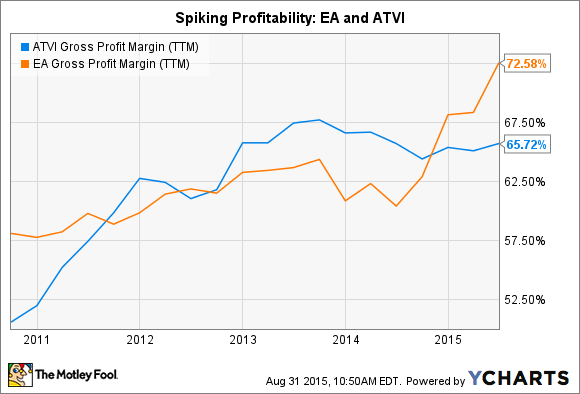 Activision is posting similarly strong gains in its operations. Digital revenue hit a record 55% of sales last quarter and, like its rival, ATVI just raised its 2015 outlook for the second time this year. People are spending more time playing Activision's games than ever before -- over 1 billion hours per month at last count. And while its perennial blockbuster franchises like World of Warcraft and Call of Duty are still popular, it's the new properties that really have management excited. The Blizzard side of the business for the first time is generating the majority of its revenue from titles other than the World of Warcraft powerhouse. Diablo and two brand-new franchises, Heroes of the Storm and Hearthstone, easily picked up WoW's slack last quarter. No one would argue that Activision hasn't earned its place next to EA in the benchmark index. After all, the Call of Duty franchise again topped console sales charts last year.Meanwhile, Activision extended its lead in the kids category with Skylanders: Trap Team and delivered the biggest new property launch in history with Destiny. 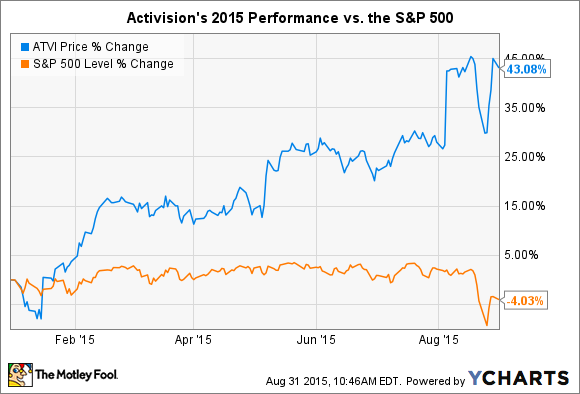 Inclusion into the S&P 500 doesn't mean a thing to Activision's business or to its long-term stock performance. As the index itself warns, "additions to and deletions from S&P Dow Jones Indices do not in any way reflect an opinion on the investment merits of the companies involved." However, the shift does raise a company's profile, which helps boost demand for the stock. That trend is accelerated by the fact that the many financial instruments tied to the S&P 500 index automatically adjust their holdings to make sure they own a piece of all of its members. So Activision's shares could see a small persistent bump thanks to this news. But long-term investors are more interested in how well the publisher expands into new geographies like China, new business models like free-to-play gaming, and new tentpole franchises like Destiny over the next five years.